I'm working on a 1/6 scale dollhouse for those cute Blythe dolls. Blythes are about 12 inches tall. They have eyes that can change colors by pulling a string in the back of their heads. My first order of business was ordering a Blythe. I first bought a clone from Thailand. I thought she would look cheap. But when she arrived I was pleasantly surprised. I just added some lighter pink hair to the front of her head. Here's a before picture below. Clone Blythe knees don't really bend much. This sitting one above has a body from a factory Blythe. She was missing some hair in the front! I took some pink extensions and added some holes in her scalp. I also tried out a chair. I wanted to try to customize the face of this doll. But my sister wouldn't let me! 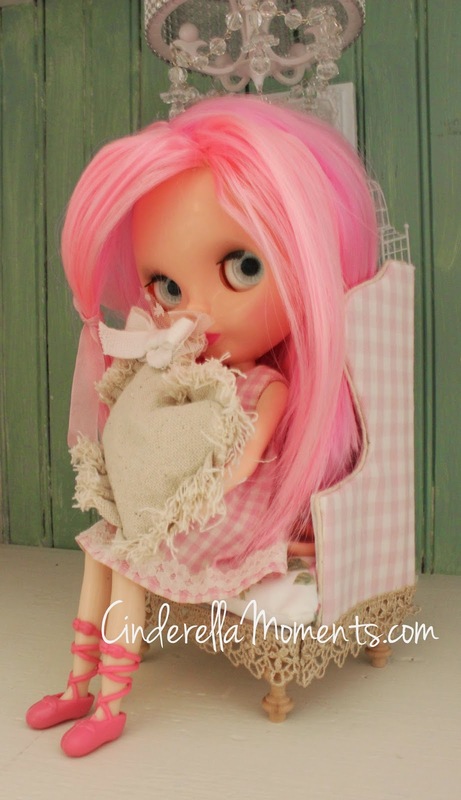 So I bought another Blythe on Ebay. This one was $15. She had her hair chopped off and someone had already done her sleepy eyes(the eyes can stay closed). She is a factory Blythe. That is the body I used for the second picture with the doll sitting. This one I did customize! I have her face already carved and reapplied makeup. Now I'm working on her hair. And the dollhouse is almost done! much work! but certainly we'd stop with mouth open, always do a great job. I cant wait to see it all! 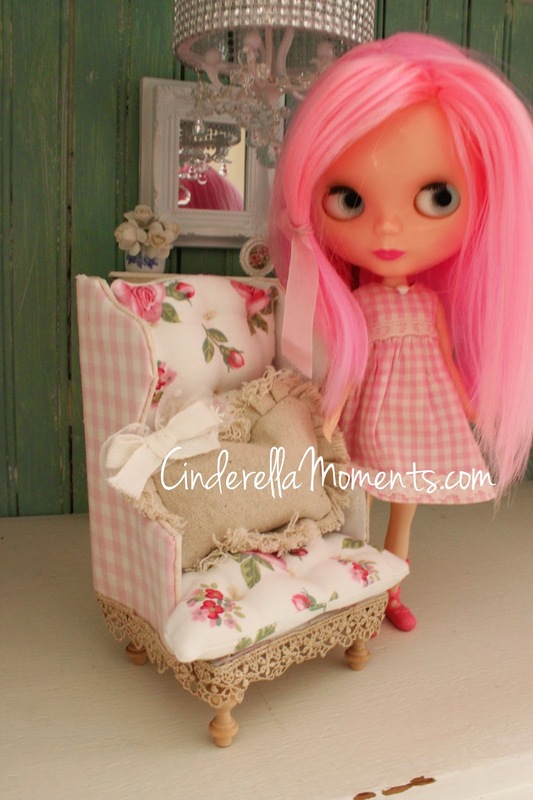 You know Caroline, there is just Something Special about Blythe dolls. I too have been charmed by their big eyes and big heads. I love what you did with the copy cat's hair. It looks just like it has always been that way. Good job! I think that you project will be a nice little break as well as a new kind of challenge. I am looking forward to seeing it all develop. working on a smaller scale house. It will be interesting, as always, to follow your fantastic work. A special project. The chair is beautiful. I'm curious to see more. Hi Caroline! Personally I am not familiar with this kind of dolls. But I love what you did with the hair of this doll, it looks much better now :D! 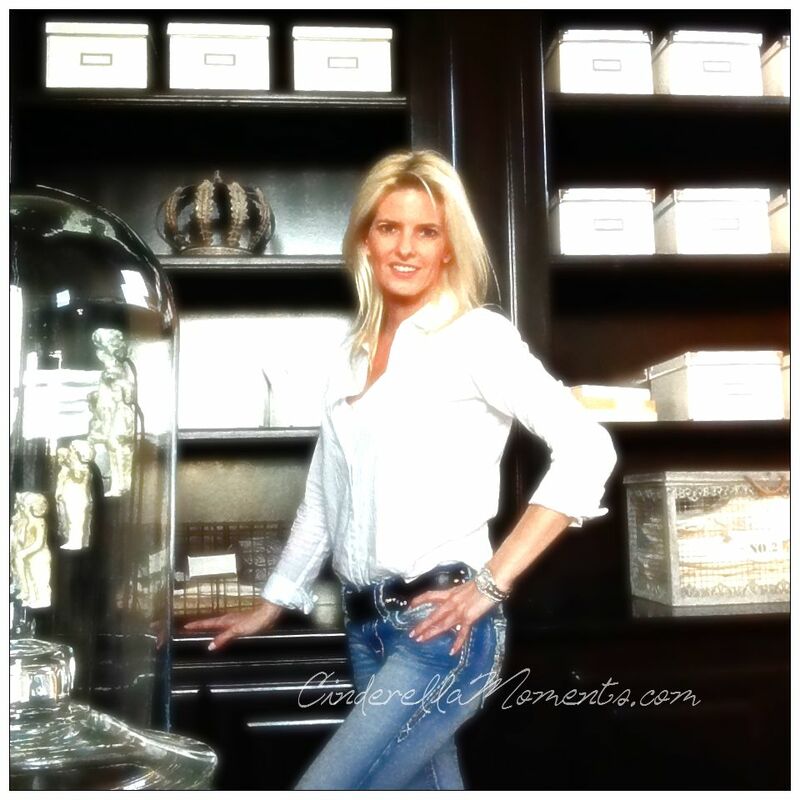 I am curious to see how you will develop this new project, the chair and the mantel are real Caroline creations, they look great ;)! Genial este nuevo proyecto. Yo también tengo un clon de Blythe y he empezado a personalizarla, tal vez también le haga una pequeña escena. Espero sus progresos. Your dolls look so cute. I love what you did to her hair. I am sure you will have great fun. 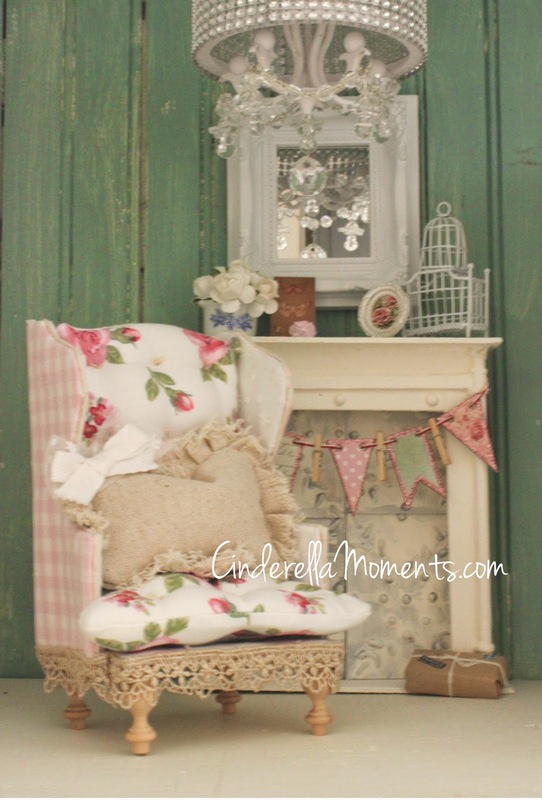 I love the chair and mantle. There is a surprise for you on my blog. I know your work will be wonderful and in 1:6 oh the wonders you can fill it with in a grand space! The chair and mantle look amazing! I know the completed work will be magic! Son unas muñequitas preciosas y tú las has mejorado mucho más. Estoy deseando ver la nueva casa terminada. I just found your blog while I was surfing on the web. I have some Blythes too and I think that you really did a great job with your doll's hair. I really love your work and will come back soon on your blog. Congratulations on your publications in the magazines! You did an amazing job with the doll and you took gorgeous photos of her. 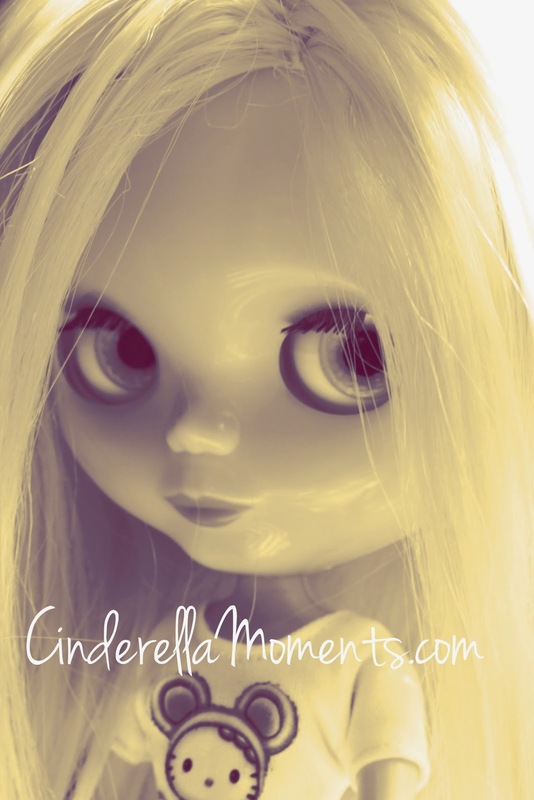 I must say that I'm not always a fan of Blythe dolls, I tend to find that they have big heads. However yours is really gorgeous and reflects your style. I love he hair style. I can't wait to see more of the furniture you're going to make for her. Designing for a doll is so much fun! You can personalize everything! I am still trying to find the perfect doll for my dollhouse. Love the chandelier with shade. You did a wonderful transformation of the doll by adding more hair. You are very clever to know how. She looks so sweet. I look forward to seeing the house.